Lorraine Serena is the Artist/Founder of Women Beyond Borders, an unprecedented, cross-cultural exhibition which celebrates and honors women’s voices and visions at the onset of the 21st Century. Serena’s work began with a team of Santa Barbara artists and currently includes hundreds of artists, curators and sponsors from forty nations. Building of community has become Serena’s artistic form. 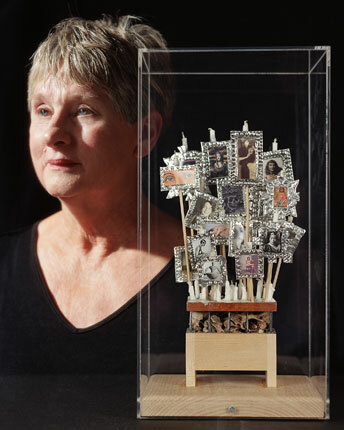 Serena’s earliest collaborations include installations at the Santa Barbara Museum of Art (1968, 1969, and 1970) with hundreds of students’ participants each year. Her teaching career has encompassed 30 years of art advocacy and classroom work in southern California. Each WBB participant received a miniature, wooden box as a point of departure. The boxes, transformed in a myriad of ways, open communication and provide the catalyst for further connection. Participating museums and galleries have sponsored exhibitions since 1995, including: Israel, Kenya, Austria, Russia, Italy, United Kingdom, Ireland, Canada, Nepal, Mexico, Cuba and Japan. The boxes have traveled from historic museums, to a temple in Katmandu, a 15th Century villa overlooking Umbria, an historic train car traveling from Austria to Russia, and most recently, a museum atop a forested hillside in a rural Japanese village, as well as a gallery in Tokyo. The boxes have been accessible to thousands of viewers through these diverse venues. As we move into the next century with a sense of solidarity and collective confirmation, there is no doubt that extending community has become the work of WBB. WBB continues to be envisioned in a manner far greater collectively than it could ever be individually. WBB participants have found the greatest meaning of the word art as derived from the Latin ars, artis: to join together. Lorraine Serena’s documentation took place in 2002. The FOTM Archive contains extensive information about this artist.